Can I just state on the record how excited I am that purple is starting to creep it's way back in style (both in fashion and in home decor)? I've long been a fan of purple, in all its many forms (though particularly in its richer, jewel-tones of plum and aubergine), and it's been frustrating trying to incorporate the color into the decor of our new house as there are precious few options in the hue. But, as I see more and more purple popping up in interiors magazines, I feel confident that is in the process of changing and that in a year or so purple will be as prevalent as yellow and turquoise are today. When I saw this gorgeous guest room designed by Jamie Drake and featured in the most recent Traditional Home (see HERE to check out the entire house) I was instantly in love. I absolutely adore how Jamie so beautifully incorporated several shades of purple. 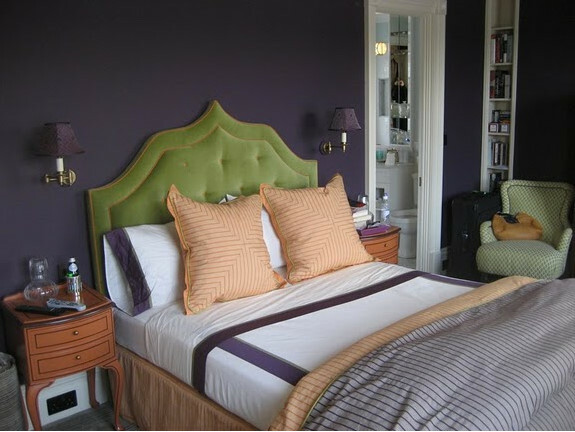 The fact that the purples don't precisely match makes the room all the more appealing to me and works particularly well with the Moroccan touches (that trio of lanterns above the bed and the mirror featured in the reading nook above are particularly eye catching). 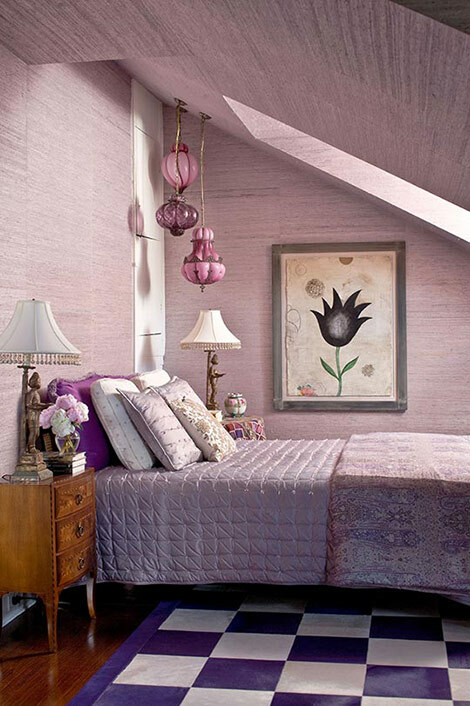 I also like the lavender grass cloth, which brings so much texture and visual interest in the room. Drake papered the low, slanted ceilings as well, which is a great way to help visually erase those awkward angles. This bedroom was featured on the cover of Sixx Design's recently published book Downtown Chic (which is a great read by the way) and for good reason: it's gorgeous. 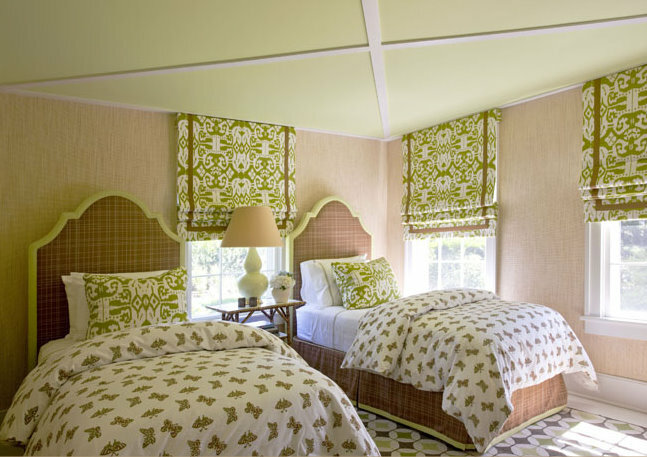 I love the gorgeous fabric used on both the bed and curtains, especially juxtaposted against that rug. 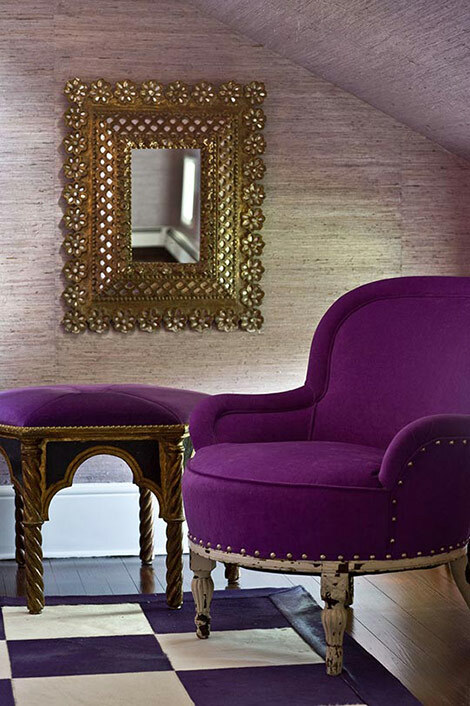 While purple isn't the dominant color in this room, it's certainly the pop of color needed to really turn up the volume in this otherwise neutral room. Again, there's a vaguely Moroccan feel to this space and I think the color works really well with the rich golds and browns the style often incorporates. 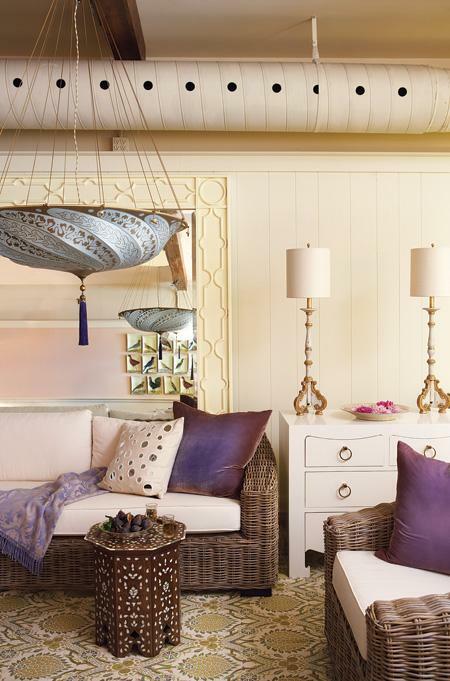 Moreover, the intricate patterns and fretwork that are hallmarks of Moroccan style are a natural pairing to purple as purple only serves to heighten the sense of luxury, drama and richness that this look is famous for. 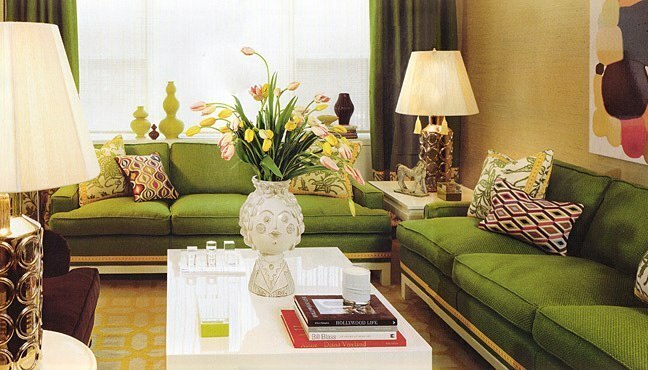 I love this office designed by LA designer Kishani Perera. Again, lavender walls act almost as a neutral with bolder iterations of purple working as accents. The chartreuse is a nice balance to the purple. As yellow-green is the opposite of purple (or red-blue) on the color wheel, the pairing is particularly attractive and a fresh, modern take on the traditional purple-yellow. Just a pretty, pretty room. 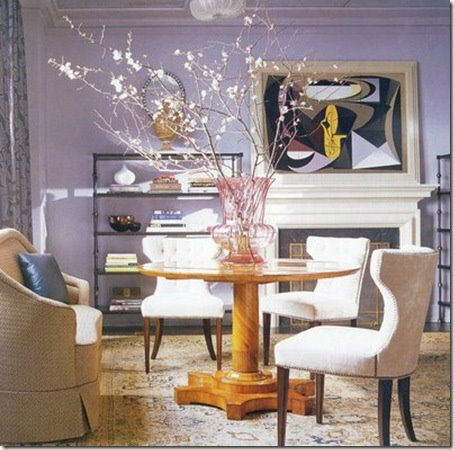 The modern art helps take the sweetness off while the giant arrangement of cherry blossoms lends a less structured, more organic feel to the traditional room. Again with the Moroccan vibe and chartreuse pairing (okay so the headboard reads as a little more of an apple green, but still!). I love the deep, rich aubergine of the walls; the cocooning effect of dark walls in a bedroom can be incredibly calming and it's a great backdrop for the brighter headboard (and it's incredible shape!). 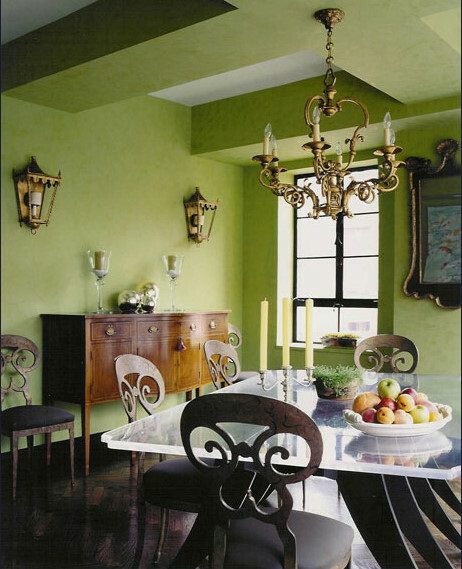 Chartreuse and purple strike again, this time in the very capable hands of Amanda Nisbet. My favorite feature in the room is the bolder plum band right underneath the crown molding. Nisbet repeats the crispness of this trim in the trim on the white linens. Such a great accent on the space and a great alternative if you don't want to wash the walls in a dark color. I also like how Amanda has hung the art straight up to the ceiling and around the headboard, which is incorporated into the arrangement as art in and of itself. 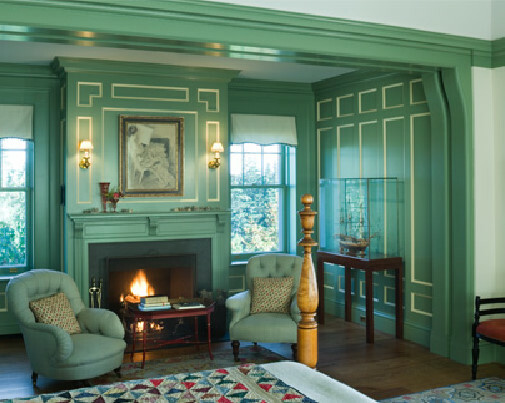 The wall colors in this bedroom are masterful -- and easily replicated by painting the same color in three different shades. 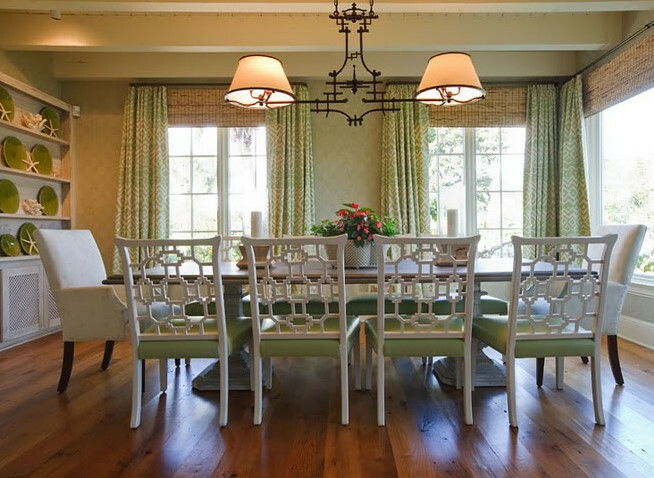 To maximize ceiling heights, paint the darkest color on bottom and the lightest on the ceiling. Since the walls should be the stars here, Kishani rightly kept the rest of the room relatively neutral, with fresh white bedding and white furniture and accessories. The pale lavender rug echoes the pale lavender on the ceiling and helps create a pleasing symmetry. 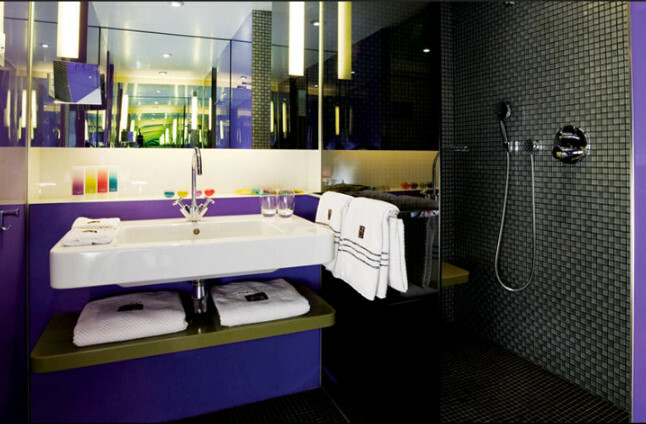 Again, a predominately neutral space with purple accents. In reality, the only purple items are the modified wing back chair and the lamp shade, with the rest of the room awash in whites, gray and beiges. Love, love, love this office. The walls are so gorgeous and, while I usually prefer white molding, the nearly tone-on-tone lilacs are spot-on as a greater contrast would have made this way too busy. The zebra rug is a great addition here, too, as it ups the glam factor and adds a jolt of pattern that's a nice contrast to the grid created by the molding. So what about you? Do you have purple in your home? If not, would you consider incorporating some into your design? Work has been incredibly hectic for me as we rush to close on an acquisition in a matter of weeks (instead of the months that we should have had). For all the craziness though, one upside to being overextended at the office is that, when things finally do settle down, you feel incredibly entitled to make the most of it and go on vacation. Dave and I are booked to take a much-deserved (for us both -- Dave has been just as busy as I have, if not more) trip at the end of May to London and then to Scotland. During our five days in Scotland, we'll be spending two nights nestled in the Highlands in Inverness and three nights in Edinburgh. 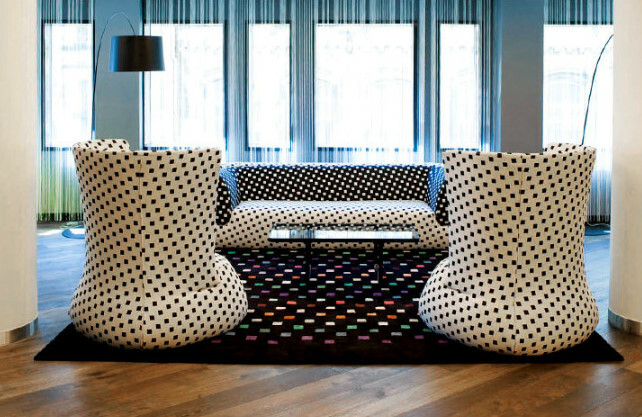 During out time in Edinburgh, Dave and I will be staying at the Hotel Missoni -- and I'm beyond excited. 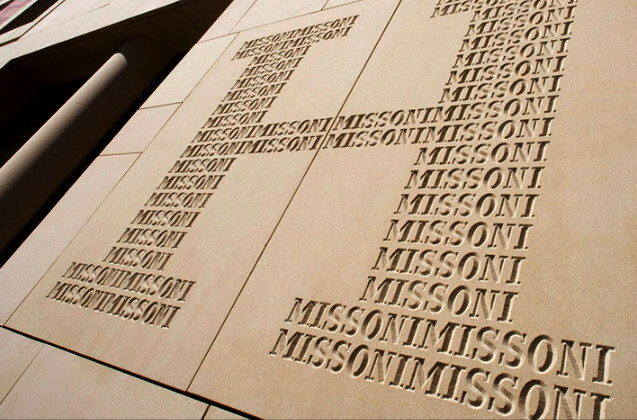 So I thought today in anticipation of my upcoming vacation, I'd indulge in a little virtual vacation and explore all that the Hotel Missoni (and Edinburgh) have to offer. I've long admired Missoni's brand; their clothes, fabrics and home accessories lines are exactly the kind of bold, brightly colored patterns that I'm always drawn to. It's very modern, but not spare. 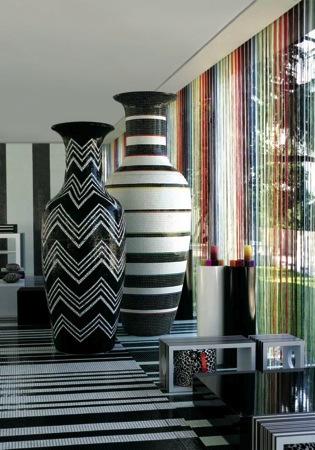 And, from the pictures I've been able to find online, their newest venture into boutique hotels (the first in Edinburgh, with more in the works in Kuwait, Cape Town, Brazil and Oman) has the exact same feeling as the rest of the line (modern, colorful and fun, but also incredibly luxe) -- and that's to be expected considering Rosita Missoni herself designed the hotel. I love the predominately black and white vibe of the lobby. It's all so very, very Missoni. The style of the hotel is far more modern than anything I would ever do in my own home...and that's not to say that I dislike modern design per se as I quite admire modern design when done well for all its crisp spareness...it's more that it doesn't feel especially "me" and it's not something I think I could live with day after day. That said though, I always try and use traveling as an opportunity to stay in hotels that have a very different design sensibility than my own home. After all, half the fun of traveling is getting to experience something completely different from what you're used to. I think my favorite design element are these giant urns in the lobby, which are visible from the street. Talk about making a statement. 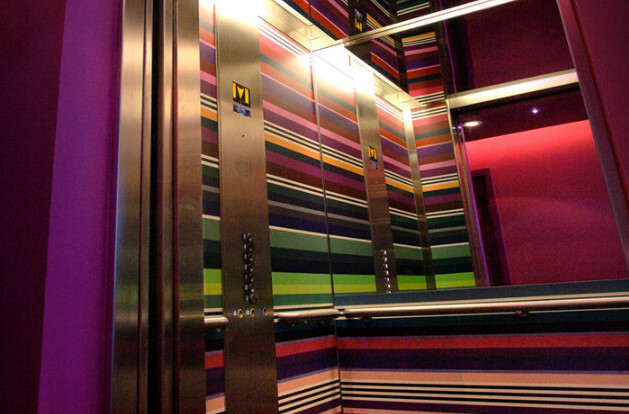 Even the hotel's elevators are decorated in signature Missoni prints. This hot pink, black and white suite is probably my favorite of the ones photographed (and I'm sure not at all representative of the baseline room Dave and I will be staying in). I love how the rug is a reverse of the pattern on the sofa and how the glossy pink buffet mirrors the pink accent wall on the other side of the space. Despite a growing penchant for more organically designed/eclectic spaces, I'm still a big fan of a well-thought out, tightly designed room like this one. The same room, from a different angle. I love all the light pouring into this space from the windows. 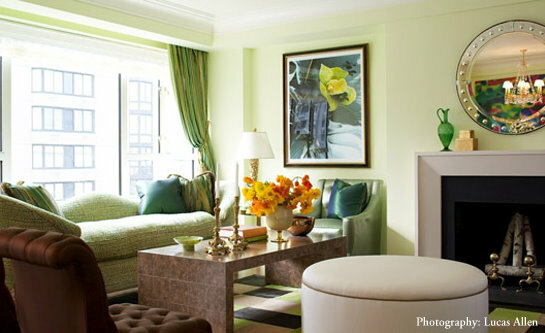 Too often hotel rooms are decorated too darkly, often to disguise cramped quarters or small windows. 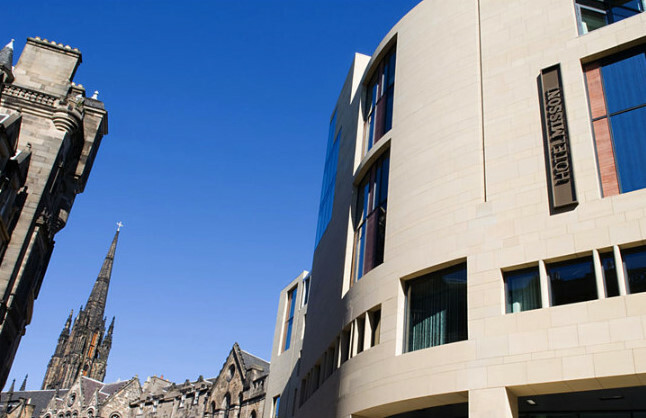 Here though, the overall feeling is one of light and space: two huge luxuries in Edinburgh. 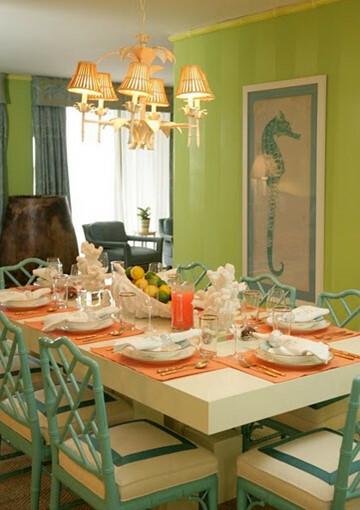 Not sure if this is the same suite, or another suite with the same color palette. 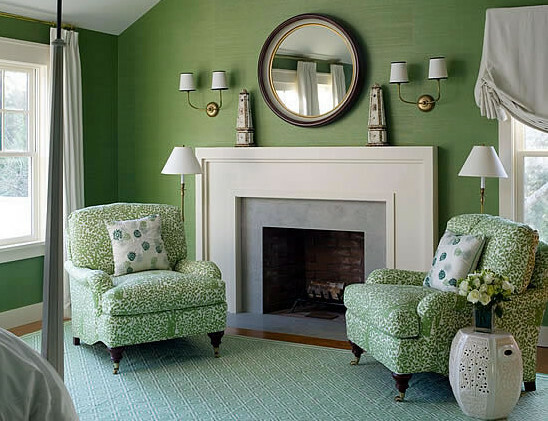 Either way though, I love that low slung, round chair; it's the perfect place to lay back and read a book or watch TV. A second style of suite, this one decorated in a more masculine black and white with small touches of red. 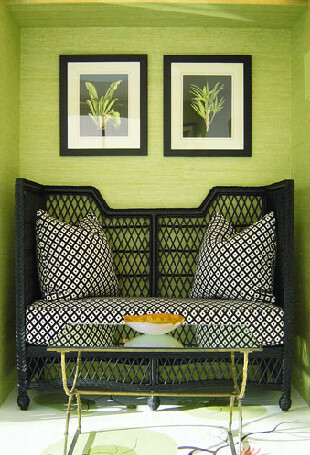 I love how these two very different styles of chair are united by the common fabric. I'm not normally a fan of shaggy carpet, but the plush rug adds a level of warmth to a room that could otherwise read as a bit cold. A smaller suite, probably more representative of the majority of the hotel's rooms. Despite the smaller size, the room is still elegantly appointed and cheerfully decorated. 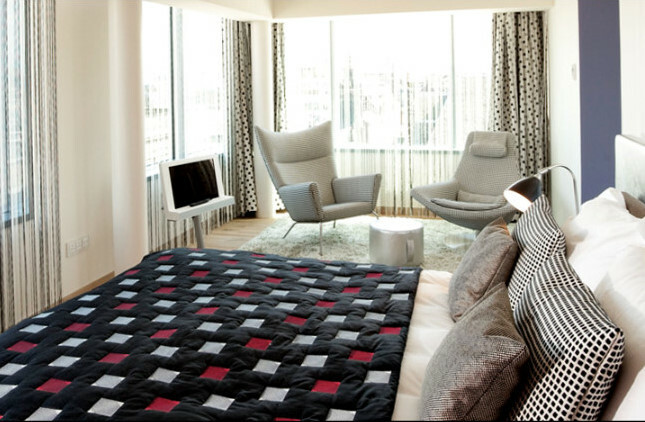 I particularly covet the zig zag pillows on the bed. Additionally, all rooms come with complimentary Wi-Fi, laundry and minibar (nothing I hate more at pricey hotels is the nickel and dime-ing you for any "extras"). I also like the pale blonde wood floors that runs through all the rooms. Not only does it add a natural (and more casual) element to these very modern interiors, but it's so much better than scuzzy hotel carpet. Another one of the "standard" rooms, this one featuring a single king bed. 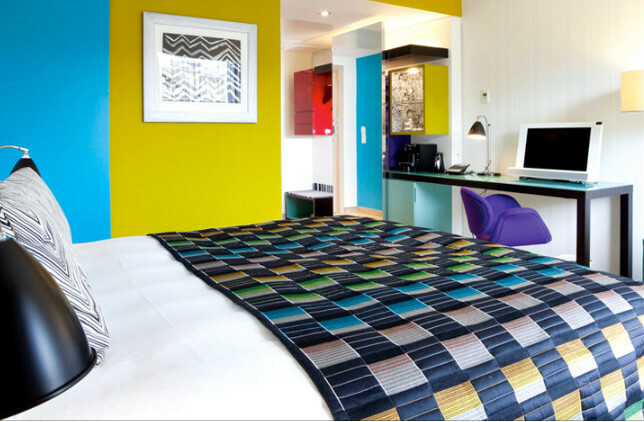 I love how the bedding picks up on the turquoise and yellow used on the walls. It's not my favorite color combination, but it's peppy and fresh. A nice change of pace from the golds, browns and reds so often favored by hotels. I tend to gauge a hotel's class by the quality of its bathrooms. I'm sure I won't be disappointed with these as they boast deep jewel-tone walls, rainfall showers and plush Missoni robes and towels. Views from the hotel. I actually spent a few weeks with my family back in the summer of 2002 touring around Scotland. We went to Glasgow, Perth, St. Andrews, and Edinburgh (with a brief day trip up to the Highlands to take a boat ride on Loch Ness). And, while much of Scotland is achingly beautiful, my favorite stop by far was the few days we spent in Edinburgh. Edinburgh's Old Town is -- as you can see from this photo -- a wonderful mishmash of ancient and modern. 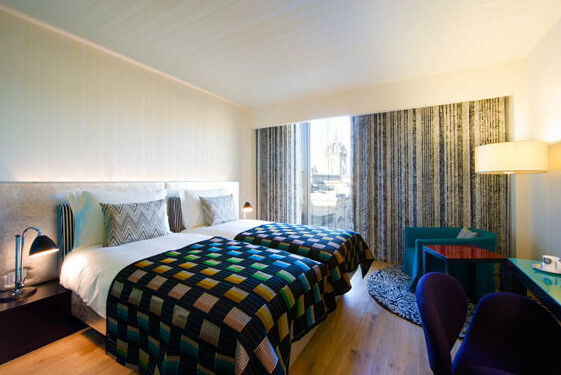 I love the idea of staying in an ultra-modern hotel right off the Royal Mile, one of the oldest streets in the UK. It's this very European juxtaposition that, as an American (and a Houstonian in particular), I find so attractive. The Royal Mile is so named as it's the approximately one mile stretch of road connecting Holyrood Palace (the official residence of the monarch in Scotland) to Edinburgh Castle (dating to the 12th century, the defensive stronghold is situated above the city on top of an extinct volcano). 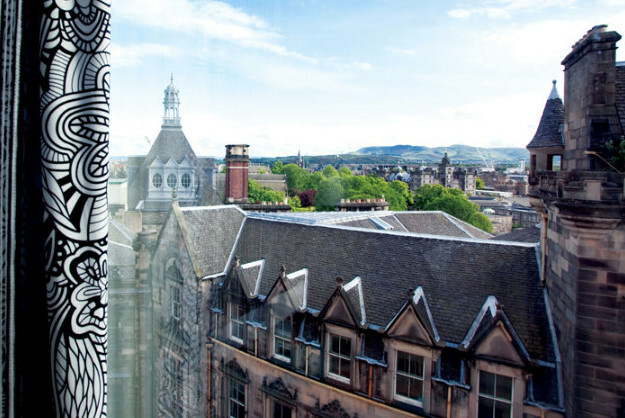 The Hotel Missoni is within a five minute walk of Edinburgh Castle and within ten minutes of . The Queen is rarely in residence, however, and typically only stays at Holyrood a few days a year en route to her private summer home in Balmoral. When you've had your fill of cultural outings, stroll over to Princes Street for the best in high street shopping. Jenners, Scotland's equivalent of Neiman Marcus or Bloomingdales, is the crown jewel of Scottish shopping and is a must-see. There is, of course, plenty of entertainment to be had inside the hotel itself as well. Dave and I plan on spending a quiet, romantic evening at their much lauded restaurant and bar. I absolutely adore the collection of prints displaying the phases of the moon in Bar Missoni. 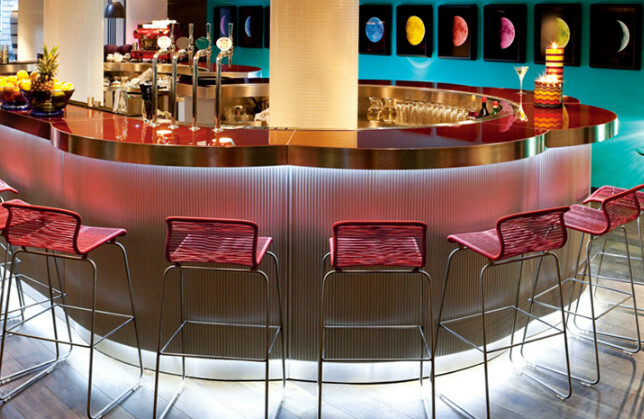 The copper-topped, flower-shaped bar is also stunning. I'll be trying out one of their signature cocktails: the Basilito, a twist on the classic mojito (a blend of basil, grape and Italian lemon), or Biennale, a twist on a bellini, but with fig and vanilla preserve and prosecco. The hotel's restaurant Cucina is (of course) Italian, with an emphasis on serving fresh, local ingredients. 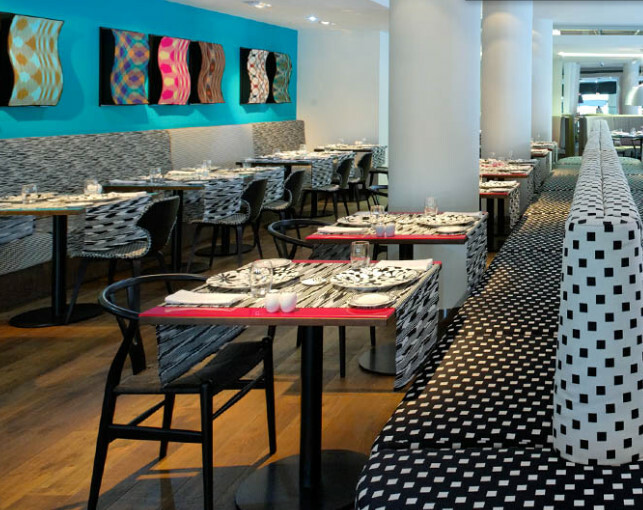 The graphic black and white patterns of the hotel lobby are carried through to the restaurant, punctuated with pops of bold turquoise and pink. 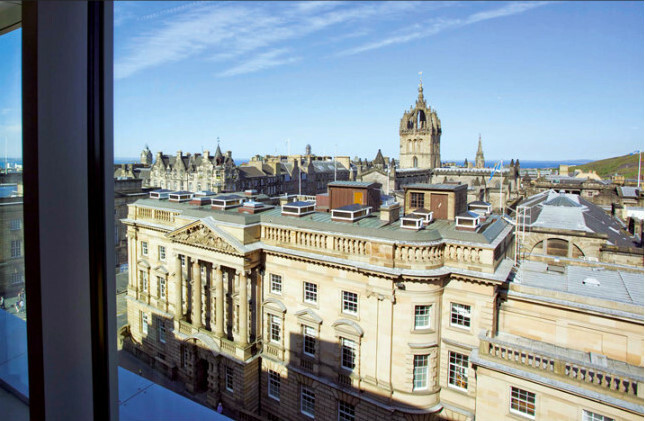 If you interested in visiting Edinburgh, my best advice is to stay in Old Town -- or as close to it as your budget will allow. Unlike London, Edinburgh does not have a subway system and getting around via cab quickly gets expensive. By staying in Old Town, you'll be guaranteed to be right in the heart of the major tourist attractions. 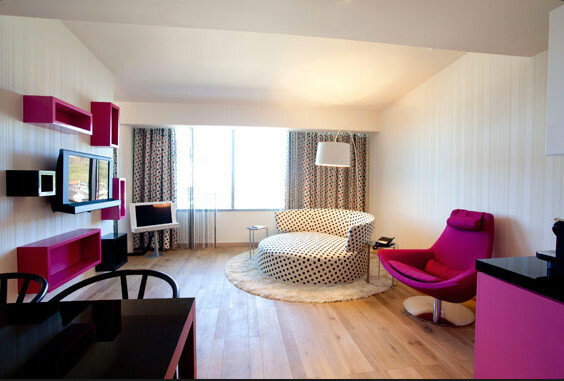 Besides the Hotel Missoni, I've also heard wonderful things about Tigerlily, another very chic boutique hotel that also happens to be more moderately priced. If you've visited Edinburgh recently, I'd love to hear your suggestions for restaurants, bars, shops and sites that we should add to our itinerary. It's always great to get travel tips first hand! 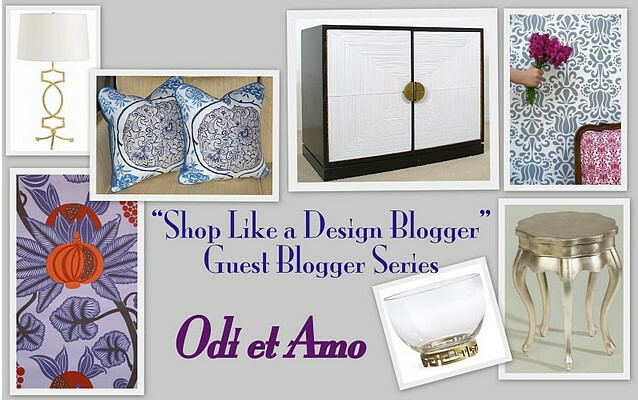 Today I'm thrilled to announce the beginning of a new weekly guest blogger series entitled "Shop Like a Design Blogger". Each Thursday, I'll be inviting one of my favorite design bloggers to detail their favorite design resources, be they for fabric, furniture, trimmings, art or accessories. But ultimately, I think what these ladies will show you over the next few months is that home decor shopping isn't just about having access to "under the radar" boutiques (though those are great fun to discover) or trade-only items, but ultimately about being creative and thinking "outside the box", keeping your mind open to surprising sources...and even about having a little patience. I thought I'd kick off the series myself and round up some of the resources that I've had the most success with in decorating my own homes (both old and new). While many of these have been featured on this blog in the past, I hope at least one or two will be new to you. 1. Plum Cushion: For pillows. If you want beautifully made pillows made out of gorgeous designer fabric (and for a reasonable price! ), look no further than Plum Cushion. 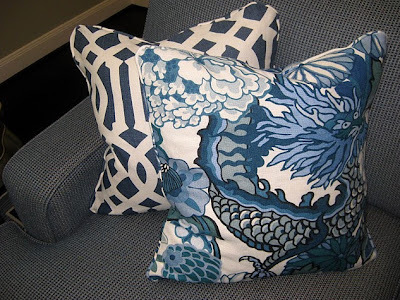 Melanie's Etsy store is usually well-stocked with some of the most popular fabrics (think KWID's Imperial Trellis or Chiang Mai), but Melanie also accepts custom orders and your own fabrics. But perhaps the best part of all is Melanie's personal (and prompt!) service. 2. Avid-Home: For great prices on trendy favorites. I scored the Windsor Smith fabric that I used to recover this stool from Avid-Home for about half the price of retail. If you're not looking for fabric though, Avid-Home also has a great selection of on-trend furniture and home accessories. If you're in the DFW area, Avid-Home also let's you pick up your orders, saving you the cost of shipping. 3. One King's Lane: For steals on just about everything. I'm a huge fan of sample sale sites: Gilt Group, Ideeli...I'm a member of them all. 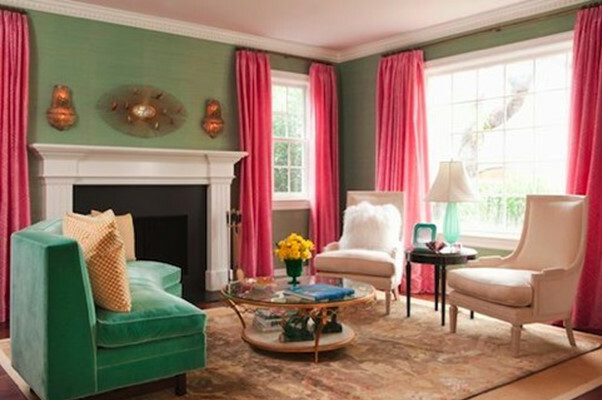 As an avid decor enthusiast, my favorite though is OKL. Sure, the selection can be random, and you have to act quickly if you see something you love, but just like a great outlet or discount store, if you're patient and keep checking in regularly, you're bound to find an amazing deal on something you love (like when I found this Anglo-Indian inspired coffee table for my living room last month!). Like all sample sale sites, OKL is members'-only, but if for some reason you aren't yet a member and are interested, just e-mail me and I'll hook you up. 4. Mod Green Pod: For eco-friendly fabric and wallpaper. One of my major pet peeves is that so many great fabric lines are trade-only so I'm always fond of fabric manufacturers who sell directly to retail. 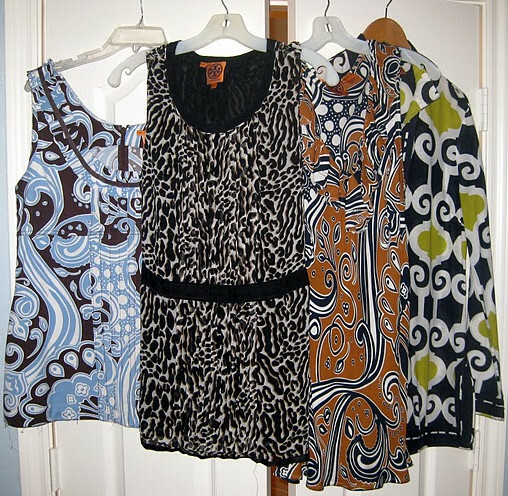 And even better if the fabrics are eco-friendly, colorful and feature great patterns. I purchased MGP's "Grand Jubilee" in cream (now discontinued) back in 2008 and used it to recover a very sad-looking wingback. Now, this once hand-me-down is our favorite chair in the house. MGP also sells a great line of vinyl-free wallpaper, and their "Grand Jubilee" pattern in Earl Grey is classic and modern at the same time. 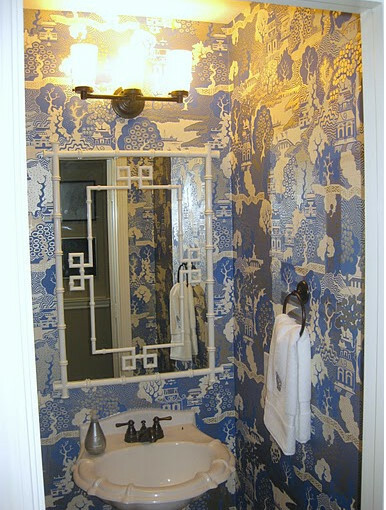 It's definitely the kind of pattern that would appeal to wallpaper-phobes. 5. Osborne & Little: For wallpaper. Is it just me or do the Brits seem to do wallpaper best? 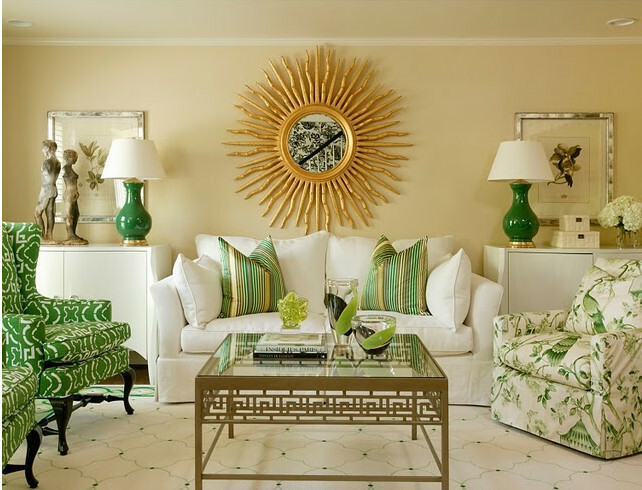 There are few patterns in O&L's extensive collection that I don't love, but my favorites include Summer Palace (shown above), Walk in the Park (how amazing would that be in a laundry or mud room?! ), Coronata (for a dining room ceiling! ), Bedlam (I am loving purple right now), and Banswara (also loving peacocks!). Unfortunately, O&L only sells directly to trade in the US (not so in the UK! ), but you can always find a friendly designer to hook you up. 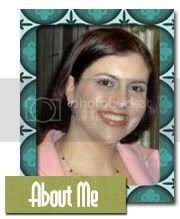 In fact, I had Susie over at Maddie G. Designs purchase 3 rolls for me and she was a total doll to deal with and gave me a good price. 6. Williams-Sonoma Home: For everything, but especially linens and small accessories. There's little at WSH I don't love. Yes, it's not cheap, but it's quality and I'm becoming increasingly convinced that it's better to go without until you can afford what you love (at least up to a point) than to have a house full of a bunch of crap. Last fall I splurged on WSH's pagoda bedding for my master bedroom, as a housewarming present to myself. And I gotta say, every night that I get into bed, I'm thankful that I did it. 7. Benjamin Moore: For paint. I've used just about every major brand of paint available, painted more rooms than I'd care to remember, and I can honestly say that BM (especially their no-VOC paint) is my favorite. The coverage is great, the color range vast, and even using a deep purple (Purple Lotus, shown above) or red (Moroccan Red -- in the old house), I didn't have to do more than two coats. 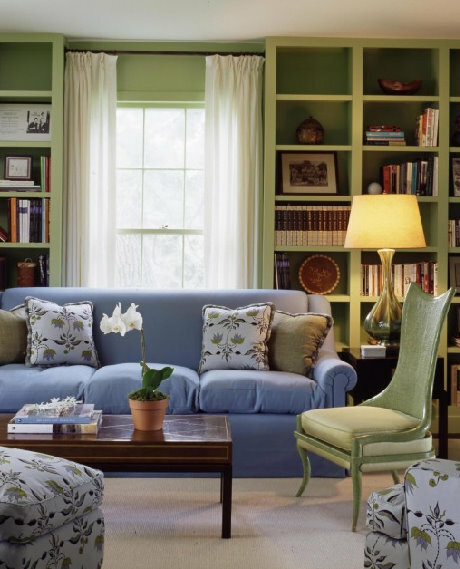 I know the prevailing belief is that Farrow&Ball is the best you can get, and while I love the colors and their depth, I don't think the coverage is as good with just one or two coats as dear old Ben. 8. Ethan Allen: For quality furniture at mid-level prices. I remember when my folks moved out to the 'burbs in the late '80s and my mom had most of their new, much larger home filled with (almost entirely) Ethan Allen. So when it came time to decorate my own house in the 'burbs, I had a (perhaps unfair) association of Ethan Allen as stuffy, traditional and terribly dated. And I suppose there are pieces there that fit all of that description perfectly. But there's also some amazing, on trend pieces (like the Rand chair, above) that are priced on par with the likes of Pottery Barn and Crate&Barrel, but are of far, far better quality. And, unlike both of those retailers, Ethan Allen has a much broader selection of fabrics, trims and finishes. So the end result is a look that's far more custom than anything else in Ethan Allen's price range. 9. TS & Company: For vintage furniture at a great price. Over the past few years I've bought several pieces of furniture from TS and Company (an Ebay seller out of Gainesville, FL). Not only are their prices reasonable, but they ship to you door (none of this Greyhound freight business!). Particular strengths are midcentury and Hollywood Regency, but they often have great campaign and chinoiserie finds as well (like this great dresser I scored back in January). Next Week's Guest Blogger: Holly from Things That Inspire! Just a quick post to say come on over to JourneyChic today to check out my guest post on my wardrobe essentials (go HERE). 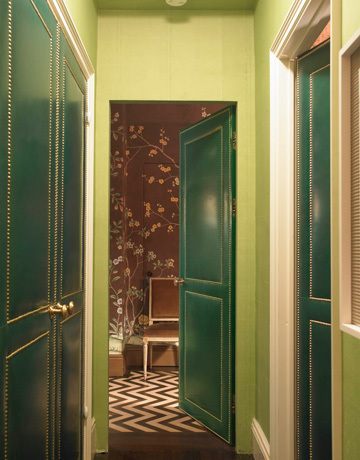 I know the majority of my posts here on Odi et Amo focus on interior design, but my interest in fashion actually predates my interest in interiors (unsurprising since most folks don't get interested in design until they actually buy a home). I think you'll see a lot of parallels in my fashion taste and my design taste -- in particular, a love of bright patterns. Many thanks to Laura for including me in her fun new series. Yesterday we managed to complete another major project around the house -- without even being here! In fact, we were in Phoenix, Arizona, this weekend attending the wedding of a dear high school friend of mine. Meanwhile, back in Sugar Land, our trustworthy and fantastic wallpaper lady completed the wallpapering job in our powder room and I'm ga-ga over the finished results -- and completely thrilled at the idea of being able to cross a big project off my interminable "to do" list without having to do it myself. If you're in the Houston area and need a referral, let me know and I'll send you Pam's information. As I discussed in an earlier post, I decided to go with Osborne & Little's Summer Palace. 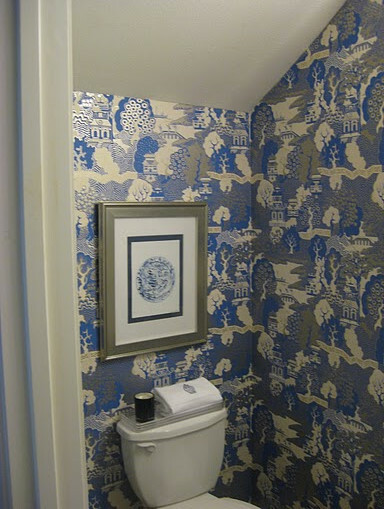 The scale of the pattern fits the size of the small powder room perfectly: it's neither too small so as to make the room feel smaller, nor too large so as I not be easily read on the narrow walls. The mirror over the sink is the Hampstead Mirror from Williams-Sonoma Home and was my Christmas present from Dave. 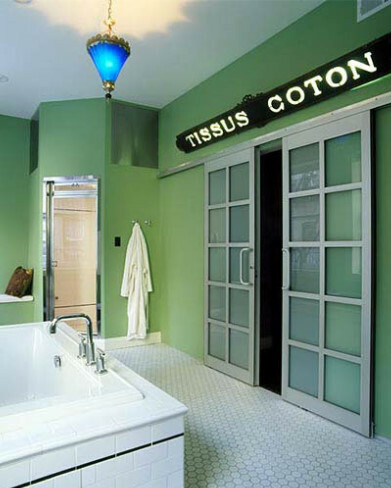 The sconce is the Asbury Triple Sconce from Restoration Hardware. 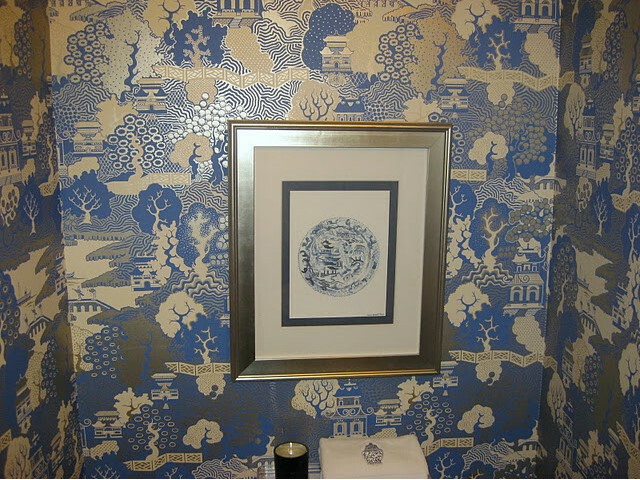 I picked up "Chinoiserie Plate" by Anne Harwell specifically for this project and framed it a standard-issue ZGallerie frame. I did have the navy mat cut for the frame though as the print was a bit off size for the white mat the frame came with. I was a bit intimidated at the idea of hammering a nail into my brand-new wallpaper, but I do like how the artwork breaks up the pattern while still coordinating with it. Finishing touches include the ginger jar hand towels from Williams-Sonoma Home and Delirium & Co. candle in Blue Absinthe from Candle Delirium.